Dem Bones — Happy Valentine’s Day! She was a lady of refinement, daughter of a lord, lost in the Bleakmere. He was a scout for the Mucklebones tribe, one of their most fierce hunters. Draak had her in his sights, ready to shoot the smooth-skinned interloper down. There was something in the way she carried herself, a regal bearing, a quiet dignity in the face of all the dangers of the swamp. He stayed his hand, and instead showed her the way to safety, revealing himself only at the end. Alora was shocked by her clandestine watcher, her hidden protector, but saw honor and nobility in his eyes. Though they were from different worlds, Alora reached out to him. Draak’s heart leapt. Ever since he was hatched, he explored. He knew there must be more to see than the twisted trees and black pools of Bleakmere. He took her hand and let the woman sweep him away. Through thick and thin, fair weather and foul, Alora and Draak traveled near and far, never leaving each other’s sides. Companions true, their love for discovery, adventure, and each other led them to experience all the great adventures the world offered. 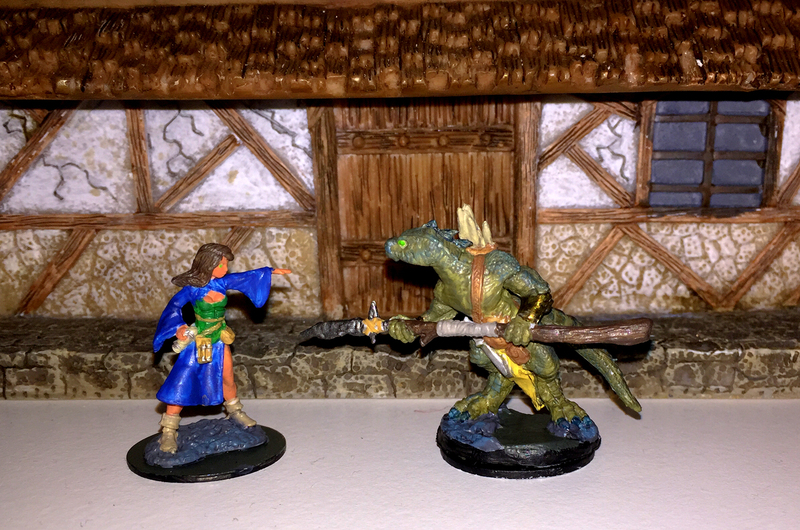 These are Reaper’s Bones Juliette Wizard and Lizardman Spearman. Juliette must have been one of the earlier castings of Bones because her features are very soft and poorly detailed. Even Lizardman Spearman suffers a bit from lack of detail around the face and chest (though his tail and legs were really nice). She photographed much redder than her skin tone really is and the subtle dry-brushing in her hair didn’t come through at all. Before I painted her, I looked on Reaper’s site, and I couldn’t even find the Bones version of this miniature. Obviously, Reaper wasn’t happy with the casting. 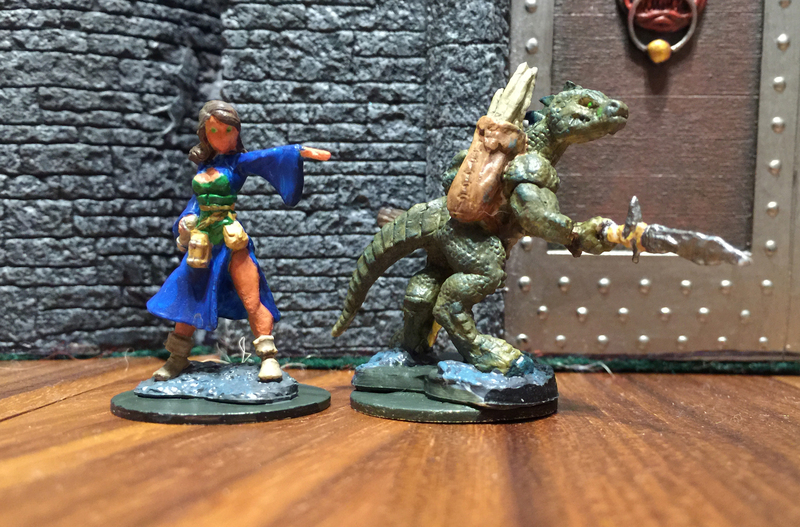 Hoard of the Dragon Queen, Session 6 – Merchants & Moneylenders! We rewound a bit because I realized as I read ahead in the adventure a bit, that the PCs need to go back to Greenest before heading to Elturel, otherwise they’d miss some good information. Game-wise, it effects nothing they did at the end of last session, so it was mostly an expository jump. Our heroes enjoyed an uneventful journey from the raider’s camp caves back to Greenest. Mayor Nighthill greeted them and gave them instructions from Master Leosin to proceed to Elturest and meet with him a human paladin of Torm named Ontharr Frume. Despite the soggy weather, they packed up and did so, arriving at Elturest and its perpetual, brilliant light a few days later. They tracked down their contacts at a tavern called Wild Cats. Ontharr Frume was a bulky, hirsute man, jovial and friendly. After conferring with our heroes, he and Master Leosin formulated a plan. He offered the Heroes of Greenest an opportunity to work with the Harpers and bade them to track the Dragon Queen’s minions to their final destination. They knew they would be joining a trade caravan heading north out of Baldur’s Gate toward Waterdeep and suggested the heroes could disguise themselves and hire themselves out to the caravan as guards. He gave them the name of an ally in Baldur’s Gate who could help them find work. The heroes boarded a riverboat that would take them to Baldur’s Gate and formulated a plan of their own. They would join the caravan to spy on the raiders, but not as guards, rather as merchants! Flint Rockbottom was already an accomplished brewer, and the rest could just as easily be his guards and support staff as they could anyone else’s. When they arrived in Baldur’s Gate, they bought supplies for the two-month journey to Waterdeep and worked with Ontharr’s contact to put together a wagon and enough equipment to masquerade as sellers of beer and fine ale. While they were setting up their wagon and equipment they spotted the raiders affiliated with the Cult of the Dragon in the staging area. A palanquin was most conspicuous, its passenger hidden from view. Unfortunately, it vanished sometime in the night. A halfling, Tom Haversford, approached Rockbottom Brewery, offering his service as a tinker and repairman, but they turned him away. While the others were planning their trip, Veya became antsy and engaged in some contests of strength at one of the nearby taverns. She left victorious, with a half-orc following after her, begging to breed with the one who bested him. When she returned to the caravan staging area, everyone was ready to depart: Rockbottom Brewery, Edherlri Lewel (exotic wood), Oyn Evenmor (exotic birds), Achreny Ulyeltin (furs and uncured hides), Lai Angesstun (scented cooking oils), three wagons carrying Cult of the Dragon members in disguise, and one wagon with settlers and drifters accompanied by various carts. For two months, they would travel together. What dangers did the road hold? Much of the session was spent planning and preparing their wagon. The adventure assumes the PCs will hire on a guards and everything proceeds from that assumption (even in future chapters). I was more than happy to let them choose another route, however. I was dismayed that I could not find, anywhere in the adventure, what the Master Leosin and Ontharr Frume wanted the PCs to accomplish other than following the dragon cultists. I couldn’t find anything that said if the PCs would meet up with them further up the road, or anything like that. This is one place where the adventure would have greatly benefited from some sort of outline or summary at the beginning of the chapter. A list of objectives. A list of challenges. Something. I guess I’m supposed to read ahead and memorize the entire adventure or cross-reference it myself (the next chapter mentions nothing about Master Leosin or Ontharr Frume as far as I can tell). This could also be one of those things that slipped past the editors, like the missing number on the map of Greenest. Two month on the road. There’s a whole slew of events that are supposed to happen, but plenty of time for me to exercise some of my own creativity, or even brush off some older material, ripe for insertion. Who would know? I could easily run a whole campaign during these two months. I know! The PCs will pass the time by playing a new game… Atomic Robo! An RPG within an RPG!